This is a hilarious and light read. I'ts a bit on the long side but when you get started the pages just fly by. I've said it before I'll say it again, I LOVE Penny read's writing. It's easy and it's carefree and it appeals to a complete nerd like myself. "If I were a function, you would be my asymptote. I always tend toward you." - I laughed out loud at that one and I think I'm one of very few of my friends who actually know what an asymptote is. I love Janie, she's what you'd call socially awkward and not many people get her with her trivial information ramblings, but I can actually relate to her. In my circle of friends I'm the who's known for knowing a LOT of useless stuff, much like Janie, but I'm quite good at keeping them to myself, unlike Janie. Most of the time anyway... She's insecure and feels unwanted and with her history I don't blame her. It's a lot easier to push people away than let them in and give them a chance to walk away, and she's good at that which is why people leave her in the first place. That makes her feel unwanted. It's a vicious circle. She's a misunderstood freak, but I'd like her to be my misunderstood freak, she's so darn cute! Quinn has some alpha-male tendencies, without ringing any alarm bells and I applaud Penny for that. Most domineering men in books today take it to such an extreme level that women LOVE to read about but would never go for. I think I would actually have liked Quinn in real life. He appreciates Janie for who she is, instead of just tolerating her, and takes her as she comes without wanting to change her. And without dictating her every move. And with a nickname like Sir Handsome McHotpants, who wouldn't go for him? This is a lighthearted and easy read, it wont change lives but it will brighten you day. Penny has a way of making you feel included like you were there in the book with them and not just observing from the outside, I don't think I've ever felt that in book before but I'm lovin' it! "However, the more stressful my situation is, the less I think about it, or anything related to it. At present , I thought about how the elevators were like mechanical horses, and I wondered if anyone loved them or named them." "I decided, as I succumbed to sleep, that men should come with manuals, subtitles, and reset buttons." I'm originally from California but now live in the Southeast US with my family. I work full time in the biotech industry as a researcher. I work a lot. I'm also a full time mom to two diminutive adults (boy-6 and girl-4), wife, daughter, knitter, crocheter, sewer, general crafter, and thought hijacker. I don't like to sit still unless I'm writing, reading, or knitting and I usually only knit in my knitting group... or at red lights while stuck in traffic. I only read on planes (where I'm trapped). Luckily, I travel a lot for work. The voices in my head (characters) became so loud over the summer of 2012- specifically, Janie Morris- that I was forced to write Neanderthal Seeks Human, my first attempt at a full length novel. It took me 7 months. 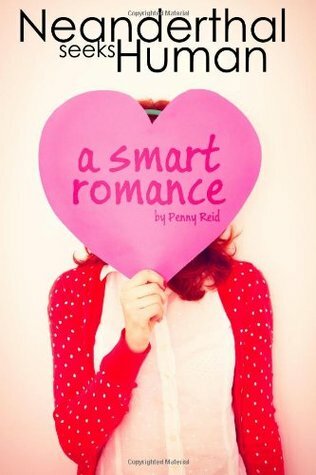 To reach Penny, contact her here through Goodreads or by any method below!